Interested in joining our family but aren’t sure of what goes on in our teams? We’ll let them introduce themselves! “In the Product team, we’re responsible for the user experience and journey with our app – and it’s so much more than just the features and interface! The journey starts when you first hear about Carousell from a friend, and it continues through the way you use the app until you become the one sharing inspiring stories to others. “Building the world’s leading selling and buying experience. Applying machine learning to make selling even easier. Millions of users a day using your software. These are the things we do in Carousell engineering, and these are the reasons we’re always so excited about going to work every day. “Data is the life-blood of Carousell, so it falls on us to constantly pump information out to all the other teams. In a data-driven culture like ours, the product and country teams depend on user trends and insights to inform their decisions and plans. Through rigorous analysis, we find the elusive patterns and trends and present them via compelling visualizations and storytelling. “The Community Team strives to make the Carousell experience a friendly and enriching one for each and every Carouseller. It’s especially inspiring for us when we chat to Carousellers during one of our events and meet-ups as they often share many heartwarming and insightful stories of their many Carousell experiences. If you see one of us at an event, please come talk to us! “The Marketplace Operations team, or “M.OPs” as we like to call it, comprises Customer Experience, Trust & Safety, and Marketplace Quality functions – basically stuff to give our Carousellers an easy-to-use and safe marketplace. Functionally, this means we cover technical product support, fraud prevention, ensuring listing quality, building friendships with governments and brands, and just simple listening to our users to find out how we can support them better. 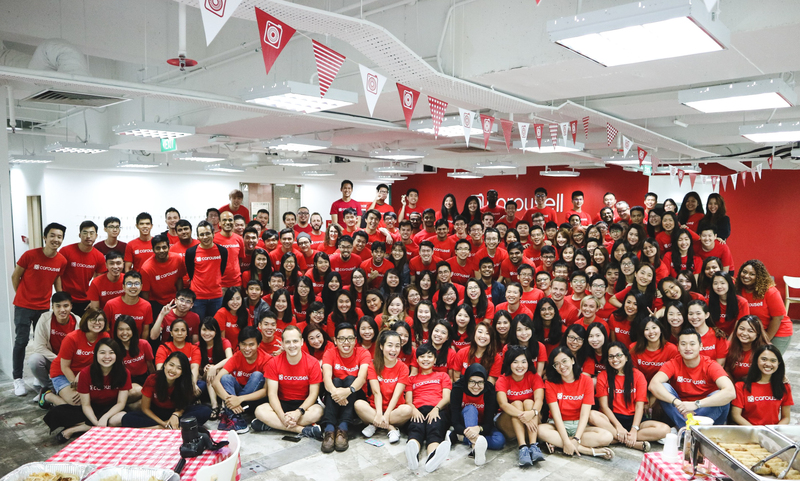 “Introducing Carousell to the world is what we do. We work on CRM, SEO, and a variety of user acquisition channels to let everyone know what our app can do, and how it helps you sell and buy things from the comfort of your couch. “Our team launches Carousell in new markets to grow our community from zero to our first 100 happy users! We constantly think up new growth ideas and initiatives, and it’s a super fun and exciting journey to watch our baby grow from something completely new in a country to a meaningful product used by hundreds of thousands of users everyday!